A Bit of Input: The 8-input, 2-bus XENYX 802 has two XENYX mic preamps with +48 V phantom power, making it possible to use two dynamic or condenser microphones. The three-band British EQ is lauded throughout the sound engineering world for its warm, musical sound. You can use the 802's effects send and return jacks to hook up to an external effects processor. Little Wonder: Weighing in at just 2.2 pounds, the XENYX 802 is the portable, practical way to turn a small performance with multiple vocalists into a sonic gem. Choirs, folk duos, coffee shops and karaoke lounges agree the XENYX 802 packs superior sound into small places. Value: Lending optimum sound quality to small-scale performances has never been this easy or affordable. 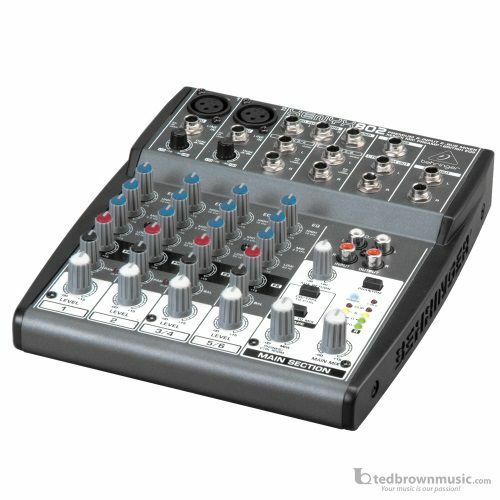 The XENYX 802 provides incredible versatility at a price other mixers in this class simply cannot touch.